As of Dec. 16, junior Addy Karmik has committed to play division I volleyball at the University of Wisconsin Green Bay. The whistle blows and junior Addy Karmik tosses the volleyball into the air. She jumps up and serves it across the net for a perfect arc — a move she has been perfecting since the 5th grade. 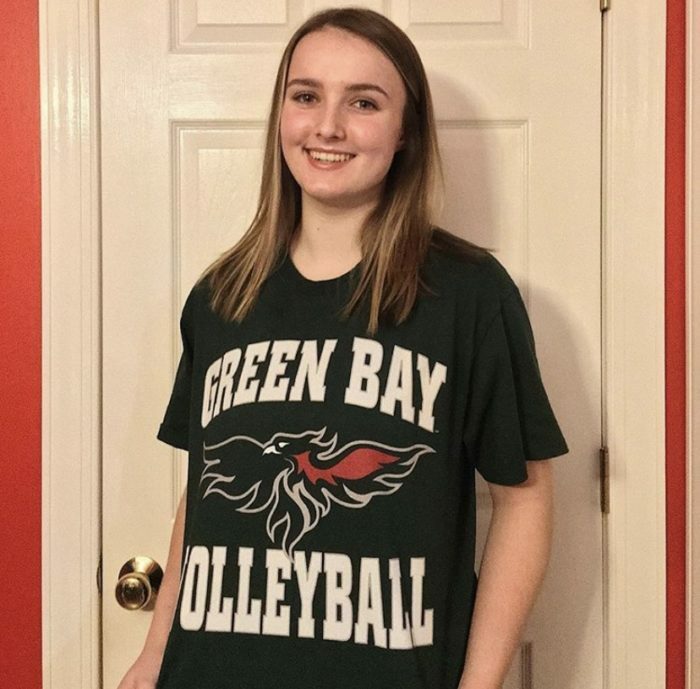 After six years of playing the game, Karmik is officially committed to play Division I volleyball at the University of Wisconsin at Green Bay. 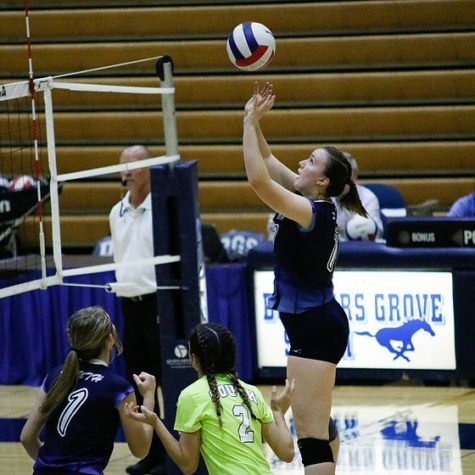 Karmik has been a starter on the DGS varsity volleyball team since her freshman year when she was surrounded by seniors committed to play at the collegiate level. Former Varsity Head Coach Trisha Kurth was the one who put Karmik on varsity as a freshman; however, Karmik had been on Kurth’s radar well before she stepped into the DGS gym. Karmik had been training as a setter for three years prior to her freshman-year tryout. Despite her current desire to become better in that position, her initial reasoning remains the basis for her decision. “It was at a [6th grade] summer camp, and I was like ‘I want to be a setter’ and then I was a setter. I think it was the only position I actually knew,” Karmik said. Kurth feels that Karmik’s skills, especially as such a young player, helped set her apart from other girls and her teammates. Karmik, as a sophomore, goes for the tip as then-seniors Nicole Zowaski and Clare McNeeley cover. “She’s competitive; she’s a team player; she wants to do well as a team. I think she’s the kind of athlete that every coach likes to have. She’s always a hard worker, she always pushes herself so that other people are seeing that and other people are doing that, too. She encourages everyone all the time. Always. On the court, off the court. She holds herself accountable, [and] at the same time she holds everyone else accountable,” Kurth said. Current Head Varsity Coach Kristina Conrad has been working with Karmik since she was a freshman, although she first coached her this past season. Conrad believes that Karmik’s desire to learn is one of her biggest strengths when combined with her knowledge of the court and the game’s intricacies. “She’s super smart and super thirsty to learn. I’m very excited for her to go on to the next level. What I’m most excited about for Addy is [how she’ll be able] to grow as a setter. For her to have a specific setting coach and someone that knows the game, she’s going to love it since she has such a thirst to learn,” Conrad said. Senior and fellow co-captain Lucy Dumford’s initial impression of Karmik was similar to Kurth’s. “Truthfully, I wasn’t surprised when she was put on varsity because Addy’s a really good player and she just has a lot of natural-born talent. Before then, she’d been playing club volleyball for about a year, and from that you could see that she was going to grow so much as a player,” Dumford said. Karmik believes that “the relationships you build with your team and with your coaches” are important in all aspects of the game, an opinion that isn’t limited to just her school or club team. “If you have a really good relationship with them, [your coach] becomes a sort of parental figure and your teammates become your sisters once you create that bond,” Karmik said. According to Kurth, Karmik’s ability to interact positively with her upperclassmen teammates helped her earn her spot as a varsity starter. “She was always taking advice from the older girls, but at the same time she was making her knowledge known; she always tried to make sure she participated and gave knowledge that would be helpful. She was never nervous. She loved the game and she loved being a part of it. She came right into the team dynamic and I think she fits well with it, and I think the other girls respected her,” Kurth said. Dumford feels that Karmik’s skills as a captain have helped her grow as an athlete and a teammate because though she cares deeply about the other girls, she isn’t afraid to put her foot down. “Addy knows when to crack down and when to fix problems, but if she needs to show her soft side to people, she’ll do that. I think she does a good job adjusting to what people need and also making sure we stay on task at practice,” Dumford said. Though she’s confident now, Karmik was originally unsure if Green Bay would be the right fit for her because of their academics. When she did a summer camp, the athletes received a short tour that highlighted their business program, which isn’t a field Karmik is interested in. “Once I finally got to check it out, when I went up to watch a game, I realized they have programs other than business and I thought ‘wait, this could actually work,’” Karmik said. Dumford, who will be playing at High Point University in the fall, was a constant resource to Karmik throughout her recruitment process. “The recruiting process is really hard and it takes a long time. Sometimes she’d feel like, I guess how everyone feels during recruiting, like they’re not very good so I think I was there to tell her ‘no, you’re good, you’re here for a reason.’ I think that was where I gave her the most support,” Dumford said. Aside from volleyball Karmik is also enrolled in honors courses and involved with different clubs at DGS. “She’s excellent in the classroom; she’s always taking on leadership roles and things like that. Even when she was young, we sent her to the leadership camp and she was so appreciative about that, so she’s that kid that you see in class that you know is going to be great one day,” Kurth said. After going up and watching a game, Karmik knew that Green Bay was where she wanted to spend her next four years. “I talked to their coaches and they were super awesome. I don’t know how to describe it, but the vibe was just super positive. They’re always talking about growth mindset and that it’s OK to make a mistake, which is such a big deal with volleyball. I felt like I was wanted there. It just validated the whole entire grind that I’ve been going through since 5th grade,” Karmik said.